When Ted Kerasote was ready for a new dog after losing his beloved Merle -- who died too soon, as all our dogs do -- he knew that he would want to give his puppy Pukka the longest life possible. But how to do that? So much has changed in the way we feed, vaccinate, train, and live with our dogs from even a decade ago. In an adventure that echoes The Omnivore's Dilemma with a canine spin, Kerasote tackles all those subjects, questioning our conventional wisdom and emerging with vital new information that will surprise even the most knowledgeable dog lovers. Can a purebred be as healthy as a mixed-breed? How many vaccines are too many? Should we rethink spaying and neutering? Is raw food really healthier than kibble, and should your dog be chewing more bones? Traveling the world and interviewing breeders, veterinarians, and leaders of the animal-welfare movement, Kerasote pulls together the latest research to help us rethink the everyday choices we make for our companions. And as he did in Merle's Door, Kerasote interweaves fascinating science with the charming stories of raising Pukka among his dog friends in their small Wyoming village. 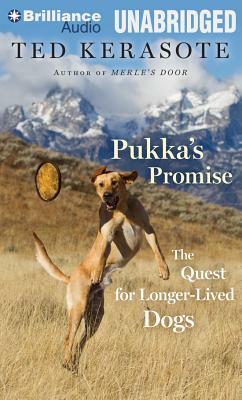 Funny, revelatory, and full of the delights of falling in love with a dog, Pukka's Promise will help redefine the potential of our animal partners.